The 34-year-old confirmed his decision after La Roja's last-16 loss to Russia in Moscow. 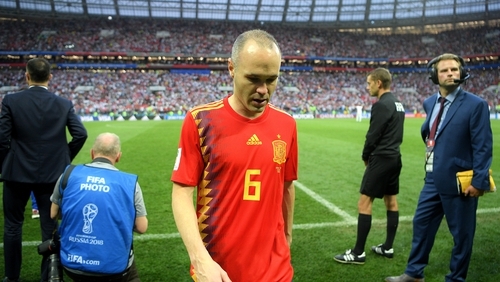 Andres Iniesta has announced his retirement from international football following Spain's World Cup exit. The 34-year-old, who scored Spain's match-winning goal in the 2010 World Cup final, confirmed his decision after La Roja's last-16 loss to Russia in Moscow. Iniesta scored Spain's opening penalty in the shoot-out against the host nation but was powerless to prevent his side losing 4-3 on spot-kicks - having drawn the match 1-1 - and tumbling out of the tournament. The playmaker, who recently left Barcelona to join Japanese side Vissel Kobe, won 131 caps for Spain. 🇪🇸 @AndresIniesta8 retires from international football. "Sometimes the finals are not how you dream them. It's true that it is my last match with the national team, on a personal level it's the end of a magnificent phase. Overall, I think it's the saddest day of my career. "There's a relay, there are players, the important thing is to find the way to success again, it is not easy, it is more complicated than it seems, but the National Team will continue."